Readers recall their most daunting educational endeavors. My roommate convinced me to take an honors philosophy class from Chauncey C. Riddle (BS ’47) at 7 a.m. It seemed like a good idea. After all, it was only two days a week. There were only about six or eight brave souls in that class, but we were all to be transformed by the process. Dr. Riddle would open our eyes on Tuesdays to mankind’s search for truth in all its forms—throughout history, across religions, and from different worldviews. He’d provide us a book’s worth of information each Tuesday, and we were to write a research paper by Thursday at 7 a.m., when we would present our papers and discuss more wonderful perspectives of life on this earth. Simple, right? Needless to say, Wednesdays were usually a blur. More than once, after a full day of writer’s block, Wednesday night became an all-nighter, making the Thursday class a blur also. Through it all, Dr. Riddle painted a masterful picture of the gospel as the ultimate perspective for understanding truth and reality, the ultimate worldview, and the ultimate source of philosophical satisfaction. My testimony was forever deepened, and my desire to share this understanding grew. Two years later, when I was a missionary pounding the pavement in Japan, my native companion told me how surprised he was to hear me answer the philosophical questions of a young man with whom we were talking. The Spirit had brought back to my mind some of these wonderful perspectives on the universal questions, allowing me to comfort another child of God. It was a class that changed my life; I never had another class like it. I’m forever grateful that I broke my own rule by taking a class before 9 a.m.
By Peggy R. Covert (BS ’79), Lowell, Mich.
One summer I took a home-study astronomy class for non-math majors. 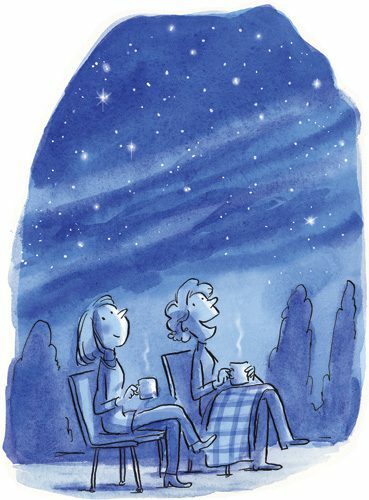 I like stargazing, and it sounded like fun. However, as I got into the material, I found that I was expected to calculate the unfathomable distances and sizes of the heavens. I was constantly expected to use math that was far beyond my abilities. The final consisted mainly of math calculations. I was totally lost! It was the only D I ever received. One thing made the hit on my GPA worth it. Since I was living at home that summer, my mother joined me for nightlong assignments watching the stars and the progression of the constellations across the night sky. We’d sit in our lawn chairs, drink hot chocolate, and have some of the most fun conversations we ever had, as the zodiac marched through the heavens overhead. That class, though extremely difficult and frustrating, actually gave me some of my favorite memories with my mom and became one of the highlights of my education. Good can come out of all things! By Debra Marshall Cook (BA ’77), Lake Stevens, Wash. In 1975 I took Spanish 321 from Professor Marian Barirecki McMaster (BA ’72). My classmates were mostly young men returned from Spanish-speaking missions. Sister McMaster, a native of Uruguay, conducted the entire class in Spanish. My high school Spanish and college classes were no preparation. I was lost. Panic set in as I realized I had no clue what was being taught or what was expected of me. It seemed I had three choices: drop the class, fail the class, or convince the instructor to speak English. Hesitantly, I pointed out to Sister McMaster that I never lived in a Spanish-speaking country. Would she please occasionally speak in English? I survived and earned a B, but more important, I saw a big difference in my ability to understand Spanish. I even registered for Sister McMaster’s Spanish 322 class. I learned more in those two semesters than in most of my previous Spanish classes combined. Now I teach high school Spanish, and Sister McMaster’s wise counsel guides my teaching. I speak Spanish and insist my students use Spanish whenever possible. My final semester at BYU as a math major was brutal. I was pregnant with my first child, and one class, Real Analysis, proved especially difficult. I struggled to understand abstract theories and proofs. My anxiety grew as the midterm approached. Would I be able to pull theorems and postulates off the top of my head for the exam? All my greatest fears were realized when I sat down in the Testing Center and looked at my midterm. To my horror, I realized I could not answer a single question. I stared at my test for over an hour, making feeble attempts to scribble something—anything—that might win me a mercy point or two. My score was as disastrous as I had anticipated. For the final the professor informed us that all test questions would be proofs taken from the textbook. Not wanting a repeat of my appalling performance, I memorized every proof in the entire book by writing and rewriting steps until I could do them in my sleep. I aced the final, and I’m sure my professor was left scratching his head at my miraculous turnaround. On the first day of Political Science 200, the instructor explained that it would be a difficult class filled with lots of research and technical writing. The large class had been divided into labs that would meet once a week. The instructor warned that probably only one person in each lab would receive an A. We had to be in attendance every week, perform well on tests, and complete every assignment. I determined that I was going to be the one in my lab to get the A. Our first lab was on a Friday. After giving some instruction and detailing our first writing assignment, the TA asked us each to say something interesting about ourselves. 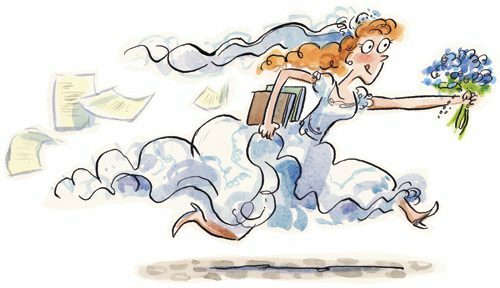 When it was my turn, I said, “I’m Harvest, and I am getting married in an hour.” The TA was shocked that I had shown up for the lab and told me that it was OK for me to leave class and go get ready. I might have been a little rushed when putting up my hair and buttoning my gown, but my dedication paid off—I ended up getting that A after all. By Amy Nelson Makechnie (BS ’98), Andover, N.H. When my sister and I walked into our first anatomy class at BYU, I pointed to a zipped-up mound on a stretcher: “Oh. My. Gosh.” We looked at each other, wide-eyed. Around the room there were more mounds on stretchers. When our TA unzipped the plastic body bags, I thought about bolting. “These bodies were donated to science,” our TA said. “Life is sacred. Be respectful.” We were instantly sobered. Every week we memorized names I couldn’t pronounce: musculocutaneous nerve, orbicularis oculi, sternocleidomastoid. Every bump (tuberosity) and joint (articulation) had a name I had to memorize for a quiz days later. Pretty soon, I was unafraid to be arm deep in cold muscle and adipose tissue. My sister and I spent hours in the lab going over anatomical terms. I cried when I got a grade that didn’t measure up to my hours of studying. The whole semester was unyieldingly tough and the pace never let up.